Today is all about the tips I wish I had known when I first started out on my gluten-free and allergy-free baking adventures. But as time went on, I started learning the tricks of the trade… much to the relief of two little sweet-toothed boys. Pretty soon, I figured out how to keep those cakes up, my breads cooked all the way through, and those muffins nice and moist! And here’s the deal…by following some, or all, of these methods below, you can become an amazing Allergy-Friendly Chef yourself! 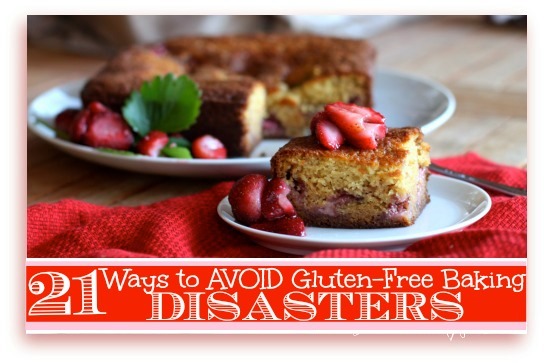 21 Ways to Avoid Gluten-Free and Allergy-Free Baking Disasters! 1. Make sure ALL of your ingredients are at room temperature, ESPECIALLY your eggs and your flours! Keeping them on the counter for about 30-45 minutes prior to using will do the trick, or, for eggs, if short on time, stick them in a bowl of warm water for 15 minutes and you are good to go. 2. Make sure that your baking powder and baking soda are fresh. Discard them if they are expired, as this will affect rise in your baked goods. To tell if baking powder is still good: combine 1 teaspoon baking powder with 1/3 cup hot water. If it bubbles, it is still good. If not, replace it. To test if your baking soda is still good, add a 1/2 teaspoon of baking soda to 4 tablespoons of white vinegar. This should fizz up. If not discard it. 3. Spoon Gluten Free flours into a measuring cup instead of using measuring cup to scoop out your flour from the container. Important because if you scoop your flour out, you will cause the flours to compact, causing more dry goods by volume than necessary. This will dramatically affect the baked good because gluten free baking is truly a science, and disrupting the balance of dry to wet ingredients can greatly alter your results. 4. Always sift your gluten free flours and all dry ingredients together (either with a sifter or with two spoons) to give your product a lighter, airier result. This is especially important because often you will blend three or four different flours together to create a recipe – this blends them all thoroughly together. 5. Here is a big one: Check your oven temperature with an oven thermometer to confirm that when you set your oven to a specific temperature, it really is working at that temperature. A ten degree temperature difference in either direction can make a big difference. If you know, for instance that your oven always is actually 10 degrees hotter than what you set it at, then when a recipe calls for something to be cooked at 350 degrees, you can actually set it at 340 degrees to get accurate 350 degree results. 6. When using glass pans, it is often wise to reduce the temperature by about 25 degrees so that the top can brown before the bottom burns. The thought behind this is that with metal, the heat radiates through the pan and then warms the food. With glass, the radiated heat passes through the food more quickly. When making Gluten Free quick breads and rising yeast breads, a heavy metal pan will actually yield better results than a glass pan. 7. Do not overfill your baking pans. Only fill 2/3 of the way full. If a baked good reaches the top of a pan during cooking and still needs to rise more, it will collapse in the center. It needs something to grip on to the sides in order to keep going up in the middle! 8. Do not overmix your batters – stir until ingredients are just incorporated and then gently fold in any nuts, dried fruits, or any other ad-ins. Gluten-Free and Allergy-Free baked goods do not rise as much as it is, so over-mixing can deflate your batter and ruin your rise. 9. On the note of rising: if you are using eggs (and are not Egg-Free), beating your eggs until they are foamy (or even separating the whites and the yolks and then beating the whites until slightly stiff and gently folding them in to the rest of the mixed batter) will often help to give more rise to a baked good. 10. Bake all of your batters as soon as the ingredients are all assembled. This will help prevent deflated baked goods. 11. When measuring Coconut Oil, make sure that you measure it in it’s liquid, not solid, state, unless a recipe states otherwise (Volumes are different). 12. When measuring Organic Palm Shortening, make sure that you measure it in it’s solid, not liquid, state, unless a recipe states otherwise (Volumes are different). 13. A good trick when making cakes and bread loaves is to cut a piece of parchment paper to the exact size of the bottom of the pan that you are using (without letting it go up the sides). And a tip from Tia, of Glugle Gluten Free, is that when using parchment paper for the bottom of your cake pan, place the pan on top of the parchment paper and draw around the outside with a pencil or pen. Cut the circle, and it is the perfect size for the bottom of your pan without going up the sides. Grease the pan as usual, taking care not to grease the sides much. This will allow the batter to cling to the sides and rise in the center, and then helps you to remove it from the pan without sticking to the bottom. 14. Remember that a steam crack down the center of a loaf of bread is actually a sign of a great cooked loaf – the crack is caused by the steam during the baking process. 15. Make sure that the center of your Gluten Free quick breads or rising yeast breads are at least 208 degrees (using an oven safe thermometer) to ensure they are fully cooked. Under-cooked Gluten-Free baked goods will often sink in the middle. 17. Another tip that I learned from a chef, is that when breads are done cooking, turn the oven off and open the door (leaving the loaf in the oven) so that the bread can cool slowly. Remove the loaf after five minutes. Taking the bread out of a hot oven and then placing it on a cold counter can make it sink too. 18. And on the note of cooling loaves, Shirley, of gfe-gluten free easily, reminded me of two more useful tips: only cool cakes in pan for about 10 minutes and then remove; otherwise, you might have a crumbled mess. Tube/Bundt cakes also cool great by sitting on the neck of a full wine bottle for those 10 minutes. 19. And when it comes to prepared doughs, Jenn, of Jenn’s Cuisine, pointed out another important tip: always let GF dough rest for at least 45 minutes before handling. This is especially true if making something like pasta by hand…wrapping up dough in plastic wrap and letting it just hang out on the counter for a while (or in the fridge for a pie crust) seems to help a bit. By the way, in case you have not seen it yet, Jenn is doing a new weekly series all about Gluten Free Substitutions right now – you can get to all of the parts of the series from this post. As of this posting, she is on Part III of the series, involving one ingredient substitutions for your favorite meals. 20. Remember that substituting ingredients is also about trial-and-error. A replacement that may work in one recipe, may not work well in another. Keep notes on what works for each recipe. Some may give a close-to-perfect match when made with substitutions. Others may give a very different look and feel to what you predicted for the recipe. Figuring out how much of a role your allergen plays in the recipe is also a good idea. 21. And Most Importantly: READ LABELS!! An allergen can be hiding in the ingredient list of a product. And always remember that “Wheat Free” is NOT the same as “Gluten Free”. Ooh! Good point, Shirley about only cooling for 10 minutes. I have gotten distracted one too many times and then have had all sorts of problems to deal with! ;0) I also love the idea of cooling tube and bundt pans on the wine bottle. I always remember my Mom doing that! I will add both of those tips, via you! I never sift-the lazy cook thing again-but I do use a fork to mix and kind of fluff all the dry ingredients together. Do you think this is adequate or should I stop being so lazy and get a darn sifter? There is something about sifting the ingredients that I fine weirdly therapeutic! LOL I usually have to take turns with my 5 year old because he loves it too. I am sure a fork will do the same thing. Although, it does seem like when you use a sifter the flour seems really light and airy! And I notice my gf baked goods do not taste as dense. If I bake alergy-free stuff (i.e. nuts, wheat-free, etc. ), I know to use different utensils, baking pans, etc., but is it ok to use the same oven? Exactly what else besides utensils and baking pans should I use to ensure no cross-contamination? Hi Kathy! As long as what you are cooking in your oven is in a clean pan, you do not have to worry about any cross-contamination coming from your oven. When it comes to cross-contamination, if there are any allergens that are normally prepared in your kitchen, then there is always the chance of contamination. Making sure that you do not share mustard jars, mayo jars, condiment jars, jelly jars, etc with knives that have been used on gluten containing or other allergen containing breads is a big thing to remember. Dips are another big source of contamination. You can try to keep a dedicated area in your kitchen to allergen free cooking as well. I thought I’d add this info for Kathy. If one is also baking using gluten flour in one’s kitchen, flour stays airborne for up to 72 hours. Therefore, ideally, any gluten-free baking should be done several days later and after a good cleaning/wipedown of everything. Ah! Excellent point, Shirley! We went to a birthday party at a cooking school recently (with Conner, my Celiac). The kids were making their own pizzas (including the dough). I had brought our own dough and had him at a table with two other boys with gluten issues – but the cross-contamination with all that flour flying around literally gave me a panic attack. I wanted to grab him and run. We did not stay long at the party. The next day he just was not himself. Not a severe reaction, but I could definitely tell that something was up with him and that the flour in the air had gotten to him. So yes, as Shirley says….Beware of flying flour!!! Oh, and also DO NOT use toaster ovens that regular gluten-filled bread has been in! Great tips! I didn’t know about measuring coconut oil or letting the loaf cool in the oven a few minutes. I often use cold eggs in my quick breads. For some reason I just don’t remember to warm them for those recipes. I should try it and see if it makes a difference. For yeast breads I warm the eggs by putting them in a bowl with hot water. It doesn’t take long to warm them up to room temperature. I know, Linda! So many of them were things my Mom used to be shocked at that I did not do. She would always stop me mid-cooking and point things out. Over the years, I have been shocked at what a difference some of these tips can make! These are great tips for baking gluten-free – thanks for putting this together. Thanks so much, Sarah! I just wanted to give people a resource that may help them overcome some of the challenges in baking gluten and allergy-free. Great post! A tip I have discovered is to always let GF dough rest for at least 45 minutes before handling. This is especially true if I am making something like pasta by hand…I usually wrap up my dough in plastic wrap and let it just hang out on the counter for a while (or in the fridge if I am doing a pie crust) and I don’t know why, but it seems to help a bit. Jenn, that recipe looks amazing! I am thinking that maybe some type of fresh lobster meat filling (since we will be at the beach this week) in your tortellini with your delicious looking cream sauce would be a great summer version. I will let you know how it works with the attachments. It was a gift, so if i am not successful, I won’t feel so bad buying a hand-crank. I have been wanting to make my own pasta for soo long now. I think I will also be trying this recipe in the Winter version you posted during the holidays when I can easily get the pumpkin puree. Thanks for sharing it. Thanks for sharing your tips, since baking allergen free doesn’t leave any wiggle room for mistakes. My tip is on using the dishwasher. I have dedicated allergen free items, such as my cast iron skillet, that cannot go in the dishwasher, but will use items that can go in it for things like coffee with creamer in it. I also put sponges through the dishwasher, so that I don’t end up smearing an allergen all over my kitchen. Hi Libby! Thanks so much for your tip! I have been reading your blog and give you such credit and adoration for handling your son’s allergies so well. The story about him trying on Halloween costumes and ending up with a blister is nothing short of horrifying! You are an amazing woman! And yes, food allergies are NOT any fun! And in my house, we do not have life-threatening ones. Ours are more GI related. I love your tip about the dishwasher and running your sponges through it as well. I, too, have dedicated pans/pots/colanders etc that are ONLY used for allergen free items. We have a beach condo that we rent out to guests and i keep an entire arsenal of pots, pans, toasters, and the like in a locked closet for when we are staying there. I also do not use any food items that previous guests may have left. Cross-contam risk is TOO high even if i know it is a supposedly safe item for us. One dip of a knife with gluten-containing crumbs into a jar of jelly that I then use for our family would make both my husband and son sick for days! Wow! These are great. I am, so, bookmarking this page. Especially since I am finally really getting into cooking/baking things other than my 5-6 regular recipes. I do have one addition to one of your tips. Can’t believe I have one. But it comes from my mom before she got divorced and stopped baking. Those are her words, not mine. Anyway, when using parchment paper for the bottom of your cake pan, place the pan on top of the parchment paper and draw around the outside with a pencil or pen. Cut the circle, and it is the perfect size for the bottom of your pan without going up the sides. I wouldn’t have thought of it if you hadn’t written the rest, though. This post is such a gift! I try to stay pretty grain-free for the most part, but I bake for the hubby and the kiddos. I do tend to use a lot of almond flours and coconut flours in my recipes though. The article is a very good one. It would be very handy for individuals who are just beginning to bake stuff. These are some great helps for baking. It’s amazing how a few little adjustments can make such big differences in the outcome. Even though I use a scale to weigh the flours when I can, I still see a difference in the finished product if I combine the dry ingredients so they’re light and mixed thoroughly. Thank You! These tips are great, some of which I already was using and a few I hadn’t thought of. With GF Baking I find that even the smallest changes can often make a big difference for better or worse. OMG, thanks so much for all of this. Please do not ever take for granted that some of these things are common sense. None of it was common knowlege to me and I am considered a person of above- average intelligence (in most cases! 🙂 ). I am the mother of a child that was recently diagnosed food allerfies and need sooooo much help. I tried making waffles and ended up wanting to throw my waffle iron out the back door and crying. I find allergy- free cooking sooo hard. However, i am determined to have my child happy to come to the table. Thanks alot! Hi Kim. Great tips for more succesful GF baking. I recently changed brands on my all purpose mflour mix from Bob’s Red Mill to Bay Milling. This wasn’t a mistake, but a catastrophe none the less. Bob’s is a garbanzo base, Bay is brown and white rice based. Needless to say, I did not get the same results with my product. I’m a commercial gf baker, so consistency is important. Yet, now I have an abundance of Bay Milling flour to use. My main problem was in adequate rising. So, to get more air in my bread, I replace half the liquid ingredients with a carbonated beverage ( I use Woodchuck Hard Apple Cider). Also, I add a TBS of mayonaise or sour cream to increase moisture. Thanks for a great blog! Hi Scott! I love the idea of using the Hard Apple Cider. I have used some other carbonated beverages in the past but have not tried the hard ciders. Will definitely have to try this in some of my baking now! 😉 And I always love to add a touch of mayo for the moisture – works great. And I have had similar issues when trying out different blends of flours. The starch and protein content/ratio makes all of the difference in the results for sure! I’d tried 5 attempts on GF quick bread. The 4th and 5th times are almost there. My first 2 attempts failed because my bread wasn’t rising, and I only found that out from testing out the baking powder that I was using. It doesn’t bubble up when I mix with hot water. Third attempt, my bread was as hard as rock, maybe using brown rice and millet own ground flour isn’t a good mixture. 4th attempt just testing out using Doves farm white bread blend, and instead of recipe called for yeast, I used baking powder 4tsp. Finally it rise up well and didn’t sink even the next day, but taste very grainy. 5th attempt only using rice flour, egg white, xanthum gum, baking powder, salt, salted butter, milk and maple syrup…….the batter rise up well, taste so so but acceptable……only thing is the top looks like earthquake, the side that rise above the pan cracks too, and when I cool it for a while and cut it using a bread knife, it crumbles and I can’t slice it really thin. I can fold the bread like our usual wheat bread. I wonder what went wrong. Was diagnosed as gluten sensitive a couple of months ago. In my country we don’t have a lot of gf things, so I had to start baking. I have tried cakes, muffins, breads and cupcakes. They all raise beautifully, but as soon as I turn off the oven I get them out and surprise surprise, they sink and shrink! Should I leave them in the oven for a bit before taking them out after I have turned the oven off? They taste great but they look awful always 🙁 please help me. I don’t know what else to try. Hello! I’m new here….and fairly new to gluten free baking (out of preference to cut it back in my family’s diet, not for clear medical reasons). I was noticing certain problems when baking, though I’ve had relative success in pretty much all that I’ve done so far. What I was noticing primarily is that my GF baked goods are looking more cooked on the outside, and very uncooked on the inside. Also, yes, it is clear they need MUCH longer to “set” than conventional, gluten baking. I can’t thank you enough for this precise list of tips, that I have been searching for for almost an hour, now. Many of the things you stated, I can see in some cases are specified in some of the recipes I have, but I ignored because it didn’t seem to make a difference that myself or anyone noticed in my regular, gluten baking. I think a big contributing factor to my primary problem is that I know that my oven is set to render a higher temperature than the factory default configuration, and I’m using a glass pan (a preference I had for my gluten banana bread–a famous concoction of mine)….which perhaps you could comment on….everywhere else says that you lower the oven temp 25 degrees for the metal pans, but I thought I saw stated in your article that you recommend this for the glass pan?? Anyway, I hope my employment of these new techniques and tips will make the difference!!! Thanks again! Thank you for sharing your tips! I cook my GF cakes in glass pans and my cakes are not coming out good. They taste well though. The problem is my cake doesnt cook well in the center but is cooked on the sides . If I take it out like that ,it sticks in the center and breaks apart. If I bake it more it gets harder on the sides . I grease my pan well before putting in the batter . Not sure whats wrong !